The ThINKin' Spot: Sweet Little Snowman & A BIG SALE!! Hello and happy day before Thanksgiving! Are ya ready for Turkey Day at your house? It's busy, busy, busy here getting ready, AND looking ahead to Christmas and all that I love about that! Decorations are the main thing for me. Well, besides the whole reason for the season and all the wonderful family traditions. I JUST LOVE to decorate for Christmas, and while my heart hasn't really been into it the past few years, I'm finding that this year I'm looking forward to it. I've got a cute little snowman tag to share with you. I used the disappearing line technique once again to color this image. I started with desert sand colored Momento ink and colored the adorable little top hat clad snowman with my Copic markers. Sorry this photo is a bit blurry. I had to grab it out of one of my galleries, as I'd deleted it from my camera. :-/ This is actually a wooden tag that I covered with patterned paper and I even had cut that little snow cutie, because I didn't have the SVG file at the time. Those SVGs to coordinate with stamps is a pretty snazzy idea, and makes fussing cutting a breeze! FIVE FULL DAYS OF 22 % SAVINGS on your entire purchase! *exceptions apply- however no minimum purchase required. Thanksgiving Day in the USA falls on the 22nd this year - which is how we determined the 22% off. NEW STAMPS!! 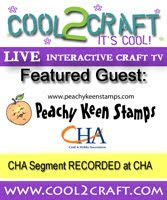 Don't look now but we will have LUCY's ABC's and 123's available for purchase at an awesome price..and they work great with the FREE STAMP SET. FREE STAMP SET This is a set four pendant/banner stamps on mylar sheet made to go with Lucy's ABC's and 123's! There is aminimum purchase required of $30.00 after discounts to get the stamp set. Please note only ONE FREE STAMP SET per household per day of the sale. Also, PLEASE NOTE...there is NO CODE needed for the free stamp and it will not show up in your cart... HOWEVER, the stamps will be included with your order. These were made to go with Lucy's ABC's and 123's! NEW SVGS!! I'm not going to tell you what this is about... but MANY have asked me for the SVG to this one! CLICK TO START YOUR SHOPPING CART! Thank you all so very much for all you do for PKS! Dave and I are so very grateful! Thanks for stopping by today! Have a wonderful day and a blessed and beautiful Thanksgiving!!! This is super adorable, Lorie! Gorgeous coloring and distressing!! Happy Thanksgiving to you and the Fam, sweet friend! Lorie - Absolutely GORGEOUS! Beautifully done! I love everything about it! Have a wonderful Thanksgiving! Your tag is stunning, Lorie !! This is absolutely adorable. Knowing you hand cut that little guy...I bow down to you, lol. STUNNING!!! WOW, I just love your work my friend. I need to try this technique one of these days. Happy Thanksgiving to you and your family. Lorie, this tag is SO sweet! Lorie, I'm a big fan of snowmen and this one is absolutely adorable. Love your technique, I saw it before but never tried it and it looks fantastic!!! I love the distressing on this tag! Gorgeous! 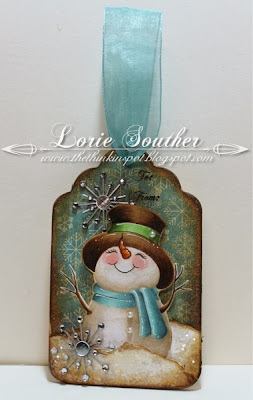 What a gorgeous tag Lorie! I love that ribbon & the image you used...great work as always & TFS!!! Adorable indeed!! Love that friendly little face. I'm always in awe of your coloring! You just make everything I draw look SOOO much better!! Love ya Lorie!